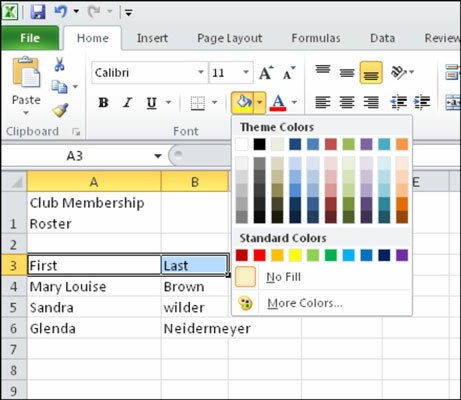 Fill color — also called shading — is the color or pattern that fills the background of one or more Excel worksheet cells. Applying shading can help the reader’s eyes follow information across a page and can add color and visual interest to a worksheet. In some types of spreadsheets, such as a checkbook register, it’s common to shade every other line, for easier reading. A theme color, or a tint/shade of a theme color: These colors do change if you apply a different theme. A standard color: These colors don’t change if you apply a different theme to the workbook. No Fill: This removes all existing fill from the selected cells. Click one of the color swatches in the Theme Colors palette. Click one of the colors in the Standard Colors palette. Click More Colors to open a dialog box of additional standard colors. Choose one and then click OK.
To change the workbook’s theme, choose Page Layout→Themes. Changing themes changes the fonts and colors used. To change only the colors, choose Page Layout→Themes→Colors.